This Creamy Garlic Parmesan Chicken & Potatoes is the best Parmesan Chicken I have ever tasted! The creamy Parmesan garlic sauce is to die for! Truth: The sauce is so good in this dish, I considered drinking it. Dare: I dare you to look at these photos and resist making this. Try, I dare you. It simply can’t be done. This Creamy Garlic Parmesan Chicken & Potatoes was a craving of mine that culminated in one of the best chicken dishes I’ve ever made. Sure, sure, everyone says that, but when you have a craving and what you make satisfies it completely, you end up in love. This here folks, was dinner perfection. Fry unti the skin is very crisp and brown on both sides. Drain the chicken and place into a large 9×13 baking pan of choice. Add in all of the garlic and fry for 1 minute. Add in the spinach and then saute until the spinach shrinks. 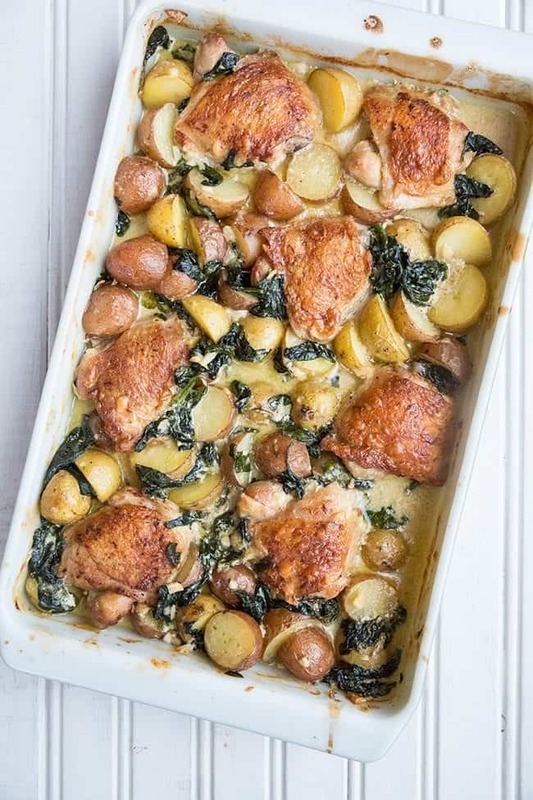 Place baby potatoes between the chicken in the 9×13 pan. If you have large chicken thighs, halve the baby potatoes, if you have smaller ones, quarter them so that they cook faster. 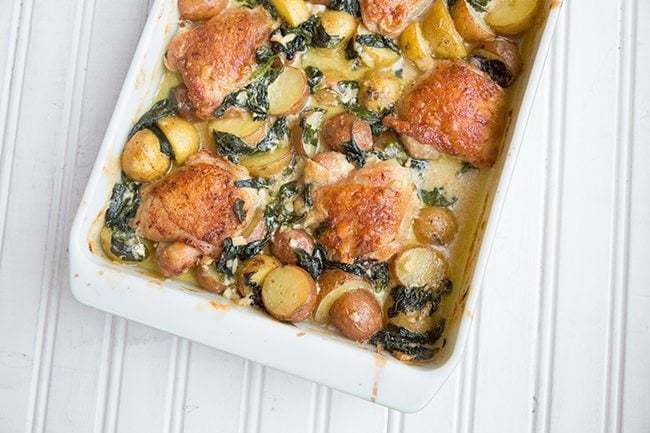 Pour the spinach and cream sauce over top of the chicken and potatoes. Bake the chicken in the oven for 25-30 minutes. The true beauty of this dinner lies in its simplicity and it’s adaptability. 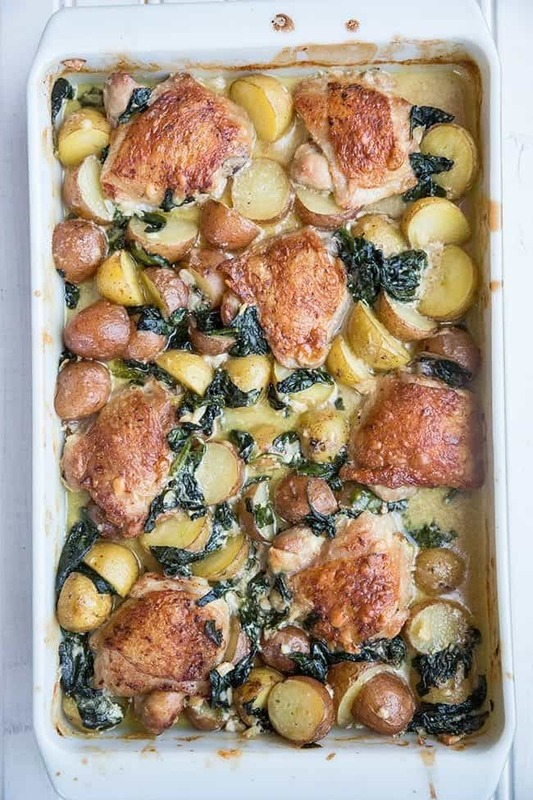 There is enough sauce that you can add in 3-4 more chicken thighs and a few more potatoes to feed an even larger crowd or have leftovers for the next day, depending on the size of your pan. It’s fast, simple and I literally whipped this up on one of the busiest days of our week, Wednesdays and we still had time to enjoy it. The initial prep is fast and then you have a good half an hour to round everyone up, gather your bearings as to “the plan” for the evening and then sit down to eat. This is the perfect meal for those GO GO GO nights. Fast, delicious and oh-so loaded up with comfort food warmth. As I write this today is Wednesday, our crazy day, which inspired me to get this recipe up for everyone. Try it this week – or weekend- and let me know what you think! Don’t forget to PIN THIS RECIPE to your DINNER RECIPES board and remember to FOLLOW ME ON PINTEREST! Easy and fast Creamy Garlic Parmesan Chicken & Potatoes, a one-dish wonder for dinner! Fry unti the skin is very crisp and brown on both sides. Drain the chicken and place into a large 9x13 baking pan of choice. Drain the fat from the pan and place back on the stove. Whisk in the chicken broth, cream, flour and Parmesan. Add in lemon juice to taste. Cook for an additional 2-3 minutes, the flour should thicken the sauce. Place the parboiled baby potatoes between the chicken in the 9x13 pan. If you have large chicken thighs, halve the baby potatoes, if you have smaller ones, quarter them so that they cook faster. Bake the chicken in the oven for 25-30 minutes or until the thighs reach a temperature of 175 °F and are tender and cooked all the way through. The potatoes should be tender. Parboil the potatoes for 10 minutes before placing them into the dish to make sure they are soft! 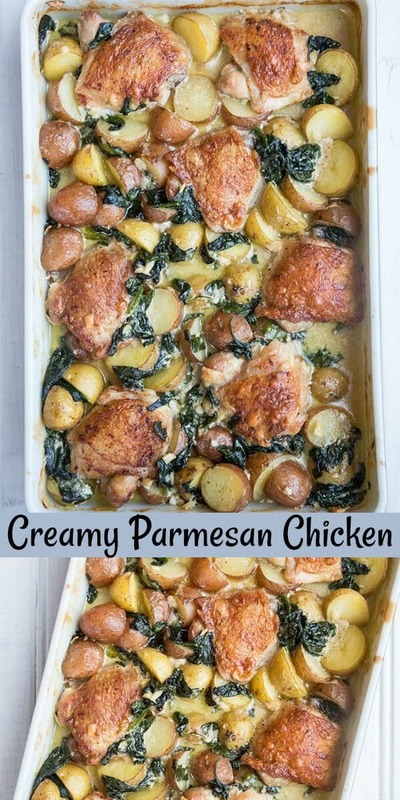 it is July 20th 2018 and I made this dish today and it is delicious I did exactly what she said except I added a little bit more heavy cream and the sauce turned out perfect and creamy and delicious I used a blend of kale and spinach on top just Divine thank you so much for sharing! I made this tonight and found it great. Followed the recipe to the letter. How do I keep the sauce separating when it’s cooking? It does it to me every time. Whisk in 1-2 tbsp of flour into the cream sauce! It helps keep it from binding together! I will give it a try, thanks! 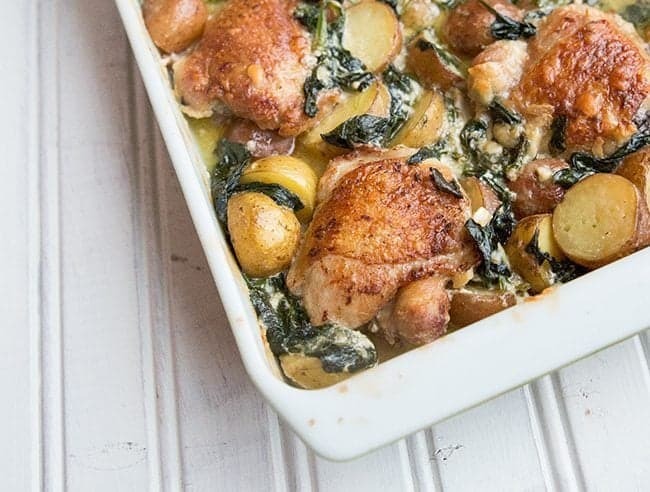 I went out and bought chicken thighs just so I could make this recipe (we’re a breast family). It was easy to make – I did parboil the potatoes as I find this makes sure the potatoes actually get done in time (!) and it turned out great. I did expect the sauce to be thicker than it was, but no matter, everyone loved it and even my picky older sister declared it one of the best meals I’ve ever made! Thanks for the recipe…a definite keeper. I’m assuming you bake the chicken uncovered in the oven? I didn’t see any specification in the recipe. Thanks! Do you have a problem with the sauce separating when it’s cooking? I only have boneless chicken breasts and I don’t get out to shop very much…is there a way to make this or should I wait until I have the thighs to cook with? I cook these in the oven for closer to an hour, they are The Best! The chicken is crisp on the outside and tender inside and the sauce is sinfully delicious. The spinach compliments the entire dish with the potatoes being an added bonus! Yummy!!! This was a hit with the entire family! Thanks for the awesome recipe! “Creamy Garlic Parmesan Chicken.” This recipe was good. Can you use skin on bone in chicken breast splits? (Prefer white meat) and would the recipe, cooking time differ? I’ve made this recipe before and to want to drink the sauce is an understatement! Making again tonight just wanted to try with chicken breasts. also, I had bought the very small “one bite” round potatoes, do you think it’s necessary to cut them in half? I would definitely cut the potatoes as the chicken breasts will cook faster ( and dry out). The sauce should help, keep the time about the same, chop the potatoes so you don’t end up having to overcook the chicken and it should be good! I did halve them however after thirty minutes I had to take the chicken out and leave the potatoes because they still weren’t done. But all in all everything came out great, I forgot how much meat was on the breasts compared to the thighs! Added to the monthly rotation, this is my kind of parmesan chicken! Tons of garlic and saucy sauce! Made this last week and the whole fam jam enjoyed this meal . A winner for sure! Thank you Magpie for another hit! I cannot say enough good about this chicken recipe. It is a new fave! Hip hip hooray, this was loved by the husband and kids! THank you! Should I still follow all the steps (frying the chicken until the skin is crisp and brown, cooking times) if I have skinless and boneless thighs? @megan Oh, the outside won’t crisp up without skin. I would cook them upside down in the pan in the sauce so that it doesn’t dry out and cook it quickly beforehand, not crisping it though. Made it, loved it. I would double the sauce and chicken and make a huge batch nex time. Have you ever frozen this? If so, what’s the process? @C Hines Potatoes and cream don’t really freeze that well sometimes…. Oh this was so delicious. Instead of chopping up my garlic I used whole pieces, and added thyme. The leftovers went really well with some pasta! Highly recommended. Thanks for sharing. @Rachs Recipes That’s fabulous, I’m so glad that you liked it! Oh this was so delicious! Oh that was so so good.